We’ve partnered with our neighbors at Satisfactory Printing to bring you a series of limited edition shirt designs available through pre-order only. Order t-shirts and sweatshirts through the Satisfactory shop portal here. 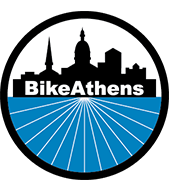 Shipping is available, or pick up at BikeAthens when the order is complete.